I’m finally back with pictures from my last day in Ecuador taken in November of 2017. I had an extra day to roam the Garden Hotel grounds in Quito because my flight was leaving in the afternoon instead of the middle of the night. It’s a different birding experience without a guide and a group. I had to find all the birds myself, but then sometimes it was easier to approach them. Although the Sparkling Violet-ear above was too far away for a clean shot, at least I captured its iridescence. And this was a little better look at the Rusty Flowerpiercer than the group had the day before. Most impressive, the Black-Tailed Trainbearers seemed to be everywhere. And not terribly shy. I particularly like the picture below of the bird trying to blend in with the tree trunk. The trunk itself suggests giant asparagus to me. I think it was some type of palm tree. The habitat surrounding the Garden Hotel in Quito looked promising for a few grassland species and I got lucky with the four below. At the top is a Southern Beardless Tyrannulet, and below it, left to right, an Ash-Breasted Sierra-Finch, Grassland Yellow-Finch and a Yellow-Bellied Seedeater. Great Thrushes were everywhere on the trip but not always easy to capture, or maybe because they were so ubiquitous I wasn’t trying hard enough. The one tanager I saw a lot of that day was incredibly hard to get a decent picture of. It is a Blue-and-Yellow Tanager. Depending on the light, it’s blue and yellow hues intensified or dulled. Another common species of grassland areas is the Saffron Finch. I was intrigued by the fact that this one had nesting material. Flying directly overhead was the Broad-winged Hawk below.I think we saw this raptor practically every day, but this was a particularly nice view. And my last day in Quito would be incomplete without a picture of the ubiquitous Eared Dove. One more of the Golden Grosbeak, who seems to be asking me why he is getting so much attention. 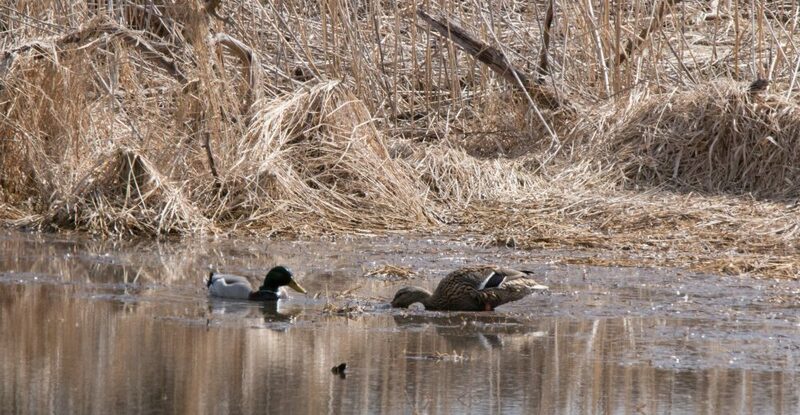 Spring is just around the corner, and breeding birds are already starting to come back to our area. I will be back soon to report.